The 3 layer Ballistech II White Mesh Head is the latest mesh head offering from Billy Blast Drums. You may remember the review I did on the original single layer Ballistech mesh head last year (Billy Blast Ballistech Mesh drum head Review). In that review I basically stated that the original single layer Ballistech was one of the better budget level mesh heads. The only draw back to that head was its life span. The new 3 layer Ballistech II appears to be the answer to the draw back of the original. I can honestly say that I was quite happy when I learned of this new mesh head option in the market place here in the States. 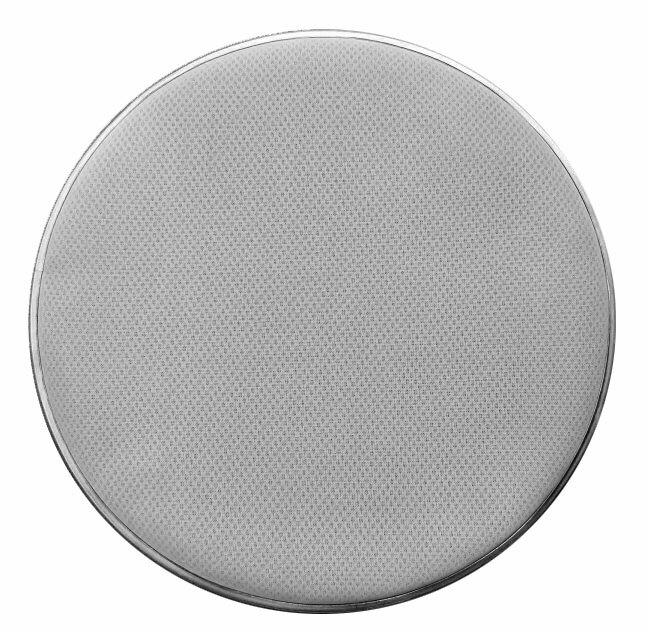 I have been using the 12″ Ballistech II mesh drum head for about a month. I have to say I’m really impressed with this product thus far. I installed the head on a DIY trigger of my own design. It is basically an “A” to “E” converted tom trigger. I also should point out that I use 5A nylon tip drum sticks. The rebound and acoustic sound of the mesh drum head was comparable to any other dual ply mesh head that I have used in the past of the same size. I used this set-up off and on over the past month. On two occasions I used the opposite ends of my sticks to simulate a heavier stick weight. I also made sure that I really played aggressively during these occasions. I basically was trying to get the head to fail or at least start to fray. I can report that it never happened. I can also report that there wasn’t much stretching of the head over this period as well. I don’t think I had to re-tighten my head in any significant way the entire time this past month. I say significant because all drum heads stretch to some degree but some stretch more than others (Like most single ply mesh heads I’ve used). I didn’t feel the stretching was any different than any other dual ply mesh that I have used in the past. At half the price of the two major brands of mesh head manufactures and the fact that this new mesh head feels about the same as the two major brands, I see no reason why someone wouldn’t at least try the new Ballistech II Mesh Drum Heads from BillyBlastDrums.com. I know I will be buying these heads as replacements once my current ones wear out. Which judging by the looks of the heads, that won’t be too much longer. Awesome review! I recently purchased a DM8 and am going to do your mod with the RealHead pads. Would you recommend that I put these 3-ply heads on all the pads or just the snare? Or perhaps some other combination of the single and 3-ply? Yes, I would recommend the newer 3 ply heads for all of the drum triggers. My Billy Blast 14″ snare head failed after only 2 months. Complete garbage product + no customer service. Stay away from this clown and his “business”. I agree with John , bought one of the billy blast “indestructible” mesh heads. Really? It lasted ONE gig! Junk! I just came across this review and was wondering how the FEEL of the 3 ply mesh heads is compared to the ones that come with the Roland kit? In other words, does the 3.0 ply head make it feel more like playing an acoustic drum? Please keep in mind that Billy Blast no longer sells mesh heads. I can still order mesh heads from billy blast or from other electronic drum sellers. Why do you think it’s not sold anymore? I’m in Toronto, and ordered from Rene a couple weeks ago. Received them no problems. I found the service excellent (a bit slow on the transit). I installed them on my hybrid acoustic kit and have used them for the first times at two gigs this past weekend. So far so good. It’s too early for a durability assessment but I love the feel all around the kit (12, 14, 16, 22). I found the triggering needed a bit of tweaking but no big deal. The only thing that is kind of weird is there is a bit of a “papery” snare buzz sound when you hear them on their own un-triggered. Not an issue at a gig monitored through IEMs or my monitors and doesn’t affect playability but it’s definitely audible compared to the Rolands on my E-kit.